Birth date and place c, 1831 Lucan, Dublin, Ireland. Physical Description Height: 5 ft. 7½ ins. Complexion: fresh. Eyes: dark grey. Hair: dark brown. Marriage date and place 1865, Dublin South, Ireland. Children Elizabeth b. 1867, Perth, Western Australia. Maria Rebecca b. 1869, Perth, Western Australia. Thomas Joseph b. 1872, Perth, Western Australia. Alice Mary b. 1874, Perth, Western Australia. John Patrick b. 1877, Perth, Western Australia. Note: This family not to be confused with the John Doyle & Anne Wallace family of Northam who immigrated to Connecticut, United States c. 1872. 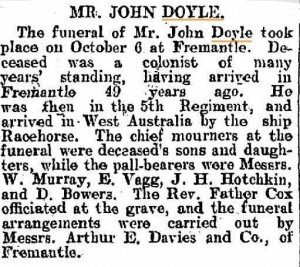 Death date and place 5 Oct 1904 Attfield Street, Fremantle, Western Australia. Burial date and place 6 Oct 1904 Fremantle Cemetery, Western Australia. Roman Catholic Area, Section MON CC, Gravesite 0290. Death Notices and Obituaries Daily News 6 Oct 1904. 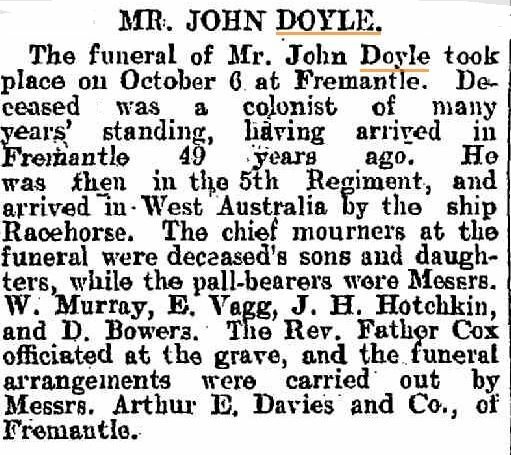 West Australian 7 Oct 1904. Western Mail 15 Oct 1904. Regiment No. and Rank #2712 Private. Attestation date and place 24 Jul 1849 Liverpool, Lancashire. Service/Campaigns Gibraltar 2 years 11 monthss. Casualty/Medical Casualty Roll: Severe wound. 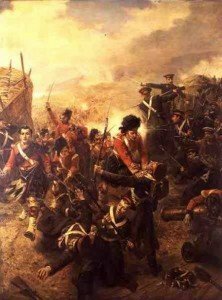 Final attack on the Redan. 08 Sep 1855. Has lost the power of pronation and supination of right forearm, and but little motion of the fingers remains on account of a musket ball having fractured the radius at about 2 inches from its lower extremity, and lodged in the interosseous space, after fracturing the ulna about 1½ inches from its carpal extremity. The man states that the ball was cut out about 9 or 10 days after the injury – wound was received on September 8th/55. Unfit for further service. District Courts Martial Deserted at Belfast 3 Oct 1849. 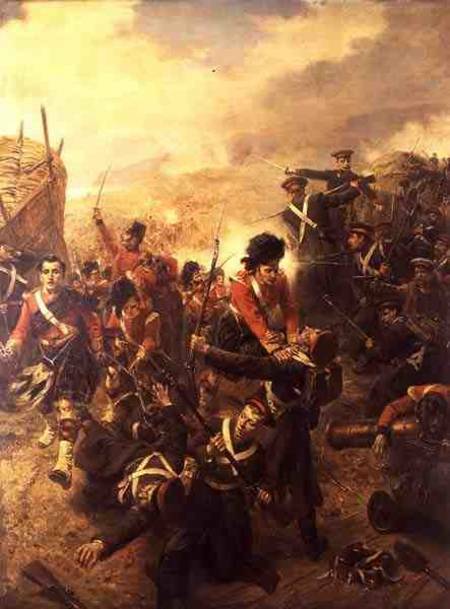 Rejoined 5 Oct 1849. Tried by District Court Martial for desertion. Convicted and sentenced 8 Dec 1849 to 84 days imprisonment. Confined 5 Dec 1849 to 28 Feb 1850. Discharge date and place 8 Apr 1856 Chatham. Length of Service 6 years 39 days. Pension Amount 9d, per diem. Increased to 1/3d. per diem 18 Jan 1881 for service EPF. Land Grant/Purchase 15 May 1884 Perth Location Y144 (grant).